All this wild weather has blown down a lot of branches and twigs around the Trust. It is an ill wind that blows no good they say, and on the advise of Susan Martin, we have been busy collecting any fallen twigs and branches that are covered in Lichen. These will be stored undercover ready for use in the summer as a dye source during the Natural Dyeing Workshop that Susan will be leading at the Trust on Sunday 17th August. 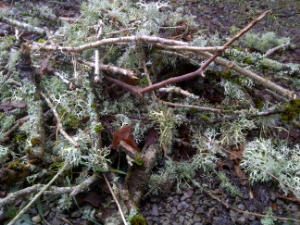 As Lichen is very slow growing, we will only be using Lichen that has fallen and will not harvest it from the trees. The various textures are really interesting and we are looking forward to seeing what colours the lichens will dye the wool. This entry was posted in Courses, Dyeing with Plants and tagged course, Lichen, natural dye, Wales, wool, workshop. Bookmark the permalink.